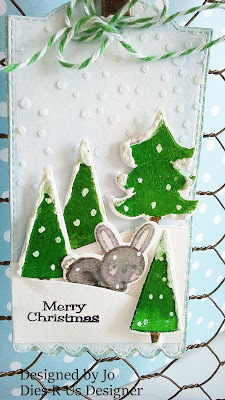 ~Jo's Scrap Shack~: New Mid-month "Snow" Challenge with Dies R Us! 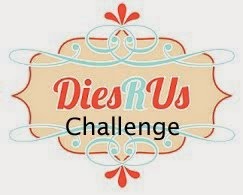 New Mid-month "Snow" Challenge with Dies R Us! Welcome to another mid-month challenge at Dies R US! The theme for this challenge is "SNOW"!! And I am sure many of you have already seen the pretty white stuff or may be looking at it right outside your window! Brrr it is cold here in New Jersey and we are expected to see our first snow flurries tomorrow! Maybe we will have a nice white Christmas! Speaking of Christmas, wow! Like really it is only 10 days away!!! **Doing the happy dance** I LOVE Christmas and one of the things I associate with Christmas is SNOW! So here is what I made for this challenge today! I used the "Lawn Fawn Snow Day Stamps" and it's coordinating Snow Day die set to make this adorable tag! You can find these cute stamps and dies in the Dies R Us store HERE. I used my Tag Dies and Tag layer dies from My Creative Time for my tag. The tag layer was cut using some PP from October Afternoon and the tag was cut using some Canson XL 140lb watercolor paper. I used my Kuretake Gansai Tambi watercolors to create a light watercolor washed background using two different shades of blue. I wanted to keep the background very light, to give a blizzardy look. I added some snowy hills that I cut by hand and decided to add some snow to give the illusion of a blizzard with the falling snow! I added the snow by using a snow stencil and some texture paste. Then I set that to dry. 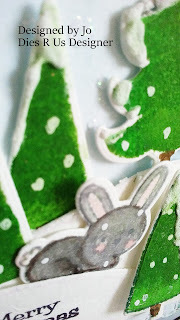 While that dried, I stamped and colored the trees and that adorable bunny from the Lawn Fawn Snow Day Stamps using my zig watercolor markers. I cut them out using the Snow Day dies and then started to build my scene by adding in the trees. I added foam adhesive to the back of the trees and popped them up, some behind the hills and some on the outside of the hills to give depth. I was trying to create a "forest" look. The sweet little bunny is also popped up on foam adhesive and enjoying his snow day! The sentiment came from an older MCT set and I thought it was perfect for this tag! To finish this tag off, I added some green and white bakers twine to the top and tied it into a bow and used my Deco Art snow writer to add "fresh fallen" snow to the trees. Then I took my white gel pen and added in a few "snow dots" on the trees and the bunny, so that it makes it look like it is snowing and coming down hard! :) I hope you like my little snowy tag! Well that is all I have for you today my friends. I appreciate you for taking time out of your day to visit me and see what I am up to. Please don't forget to stop by the Dies R US challenge blog to see what the rest of my design team sisters have created for you today. And make sure to link up your own project too! And for more inspiration, check out the Dies R US Inspiration blog . You will find yourself browsing for awhile. There are so many gorgeous projects that will surely inspire you and get your creative mojo flowing. I want to wish each of you a very Happy Holiday season and a Happy & healthy new year!!! Thanks again for stopping by! Oh how Sweet! Adorable little scene Jo! Have a great day! Adorable tag!! Cute little bunny! Awww, Jo, this is darling. Love the sweet little bunny and how you nestled him in the layers of snow. The texture on this card is awesome! What a fun winter scene! I love the snow on the trees. Cute card....Merry Christmas! 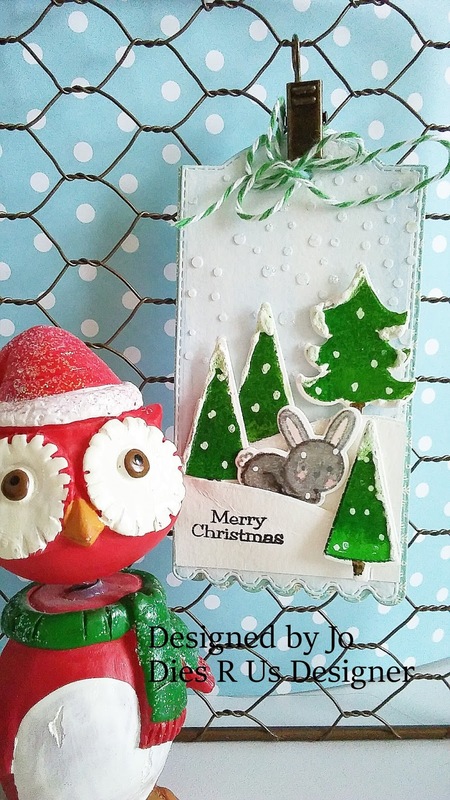 I just love your darling Christmas tag Jo! The little bunny looks so sweet among the trees on the snow covered hill, love the snowflakes! Aaaw, what a darling tag Jo! The tree's look amazing and love the sweet little snow bunny! So cute! Hope you are having a great week so far! I can't believe just a few more days til Xmas. It's been busy on my end with trying to get ready for Christmas and also throwing in a handful of trips back and forth home. I am looking forward to this weekend~just hanging out with my children and their families! The little grand babies are going to have a ball this year:) I think I told you, but we have 2 more grand babies on the way....we are going to be BUSY, BUSY!! But, it's exciting for all! Have a good day and Merry Christmas Jo!